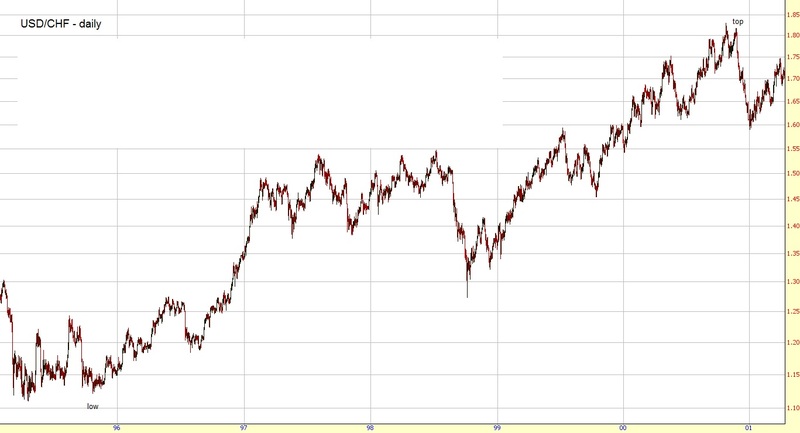 As mentioned in chapter 1 corrective waves trend in the opposite direction of the wave of one larger degree and are lettered. Unlike motive waves corrective waves can be very complex and difficult to identify. 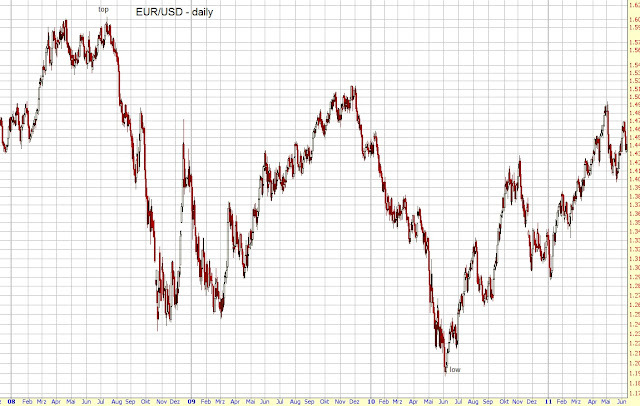 Furthermore there are much more corrective than motive patterns. 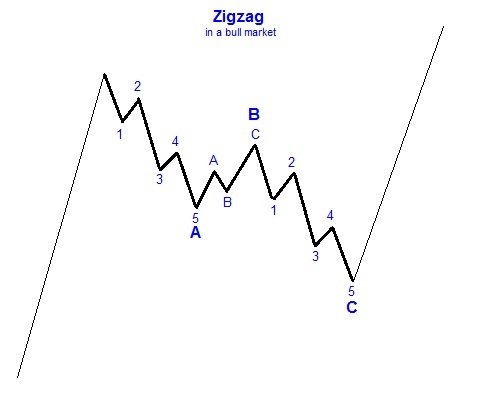 A zigzag subdivides into three waves. 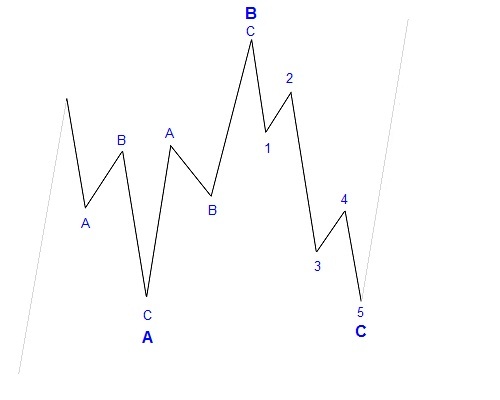 The sequence of these subwaves is 5-3-5 (i. e. wave A consists of five, wave B of three, and wave C of five waves). Subwaves A and C are usually impulses. Only rarely they are diagonals. Wave B can't retrace more than 100 % of wave A and can be any type of corrective pattern. The SPX formed a top in late October 2011 at 1290. The first impulse down to 1215 is labeled wave A. 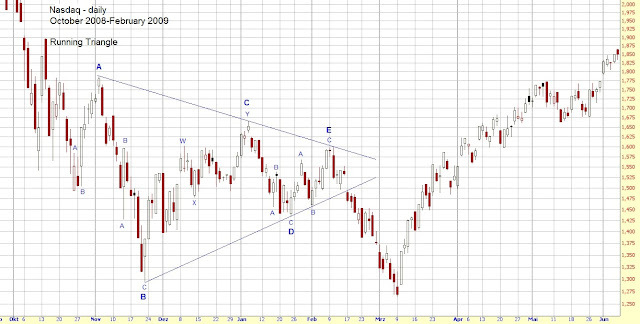 Wave B followed and formed a triangle (type of a corrective pattern; you'll learn triangles soon). 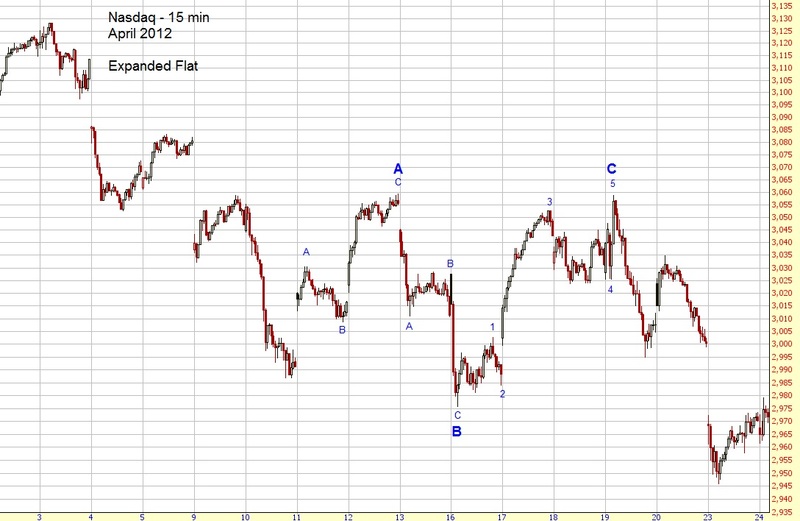 Lastly, another impulse occured (wave C) which completed the zigzag at 1160. 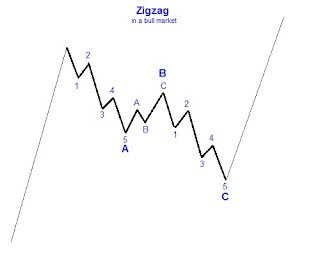 If a single zigzag is too short to complete the whole correction it’s possible to get two or three zigzags in a row in which case it’s called a double or triple zigzag. 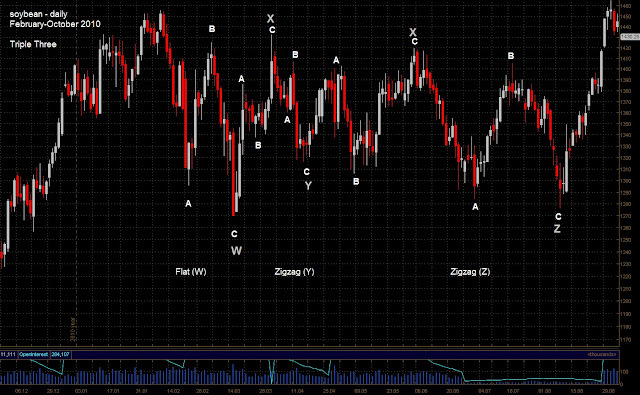 For reasons of clarity the first zigzag is labeled wave W, the second wave Y, and the third wave Z. 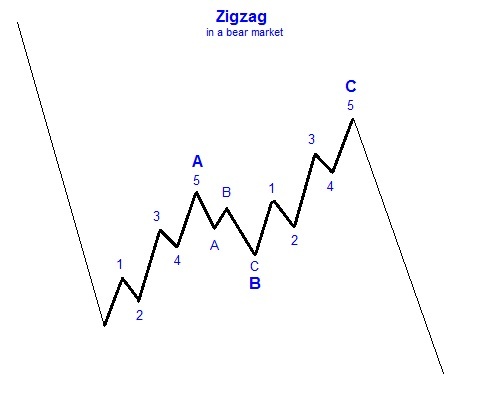 The zigzags are connected by a wave X which can be any type of corrective pattern. 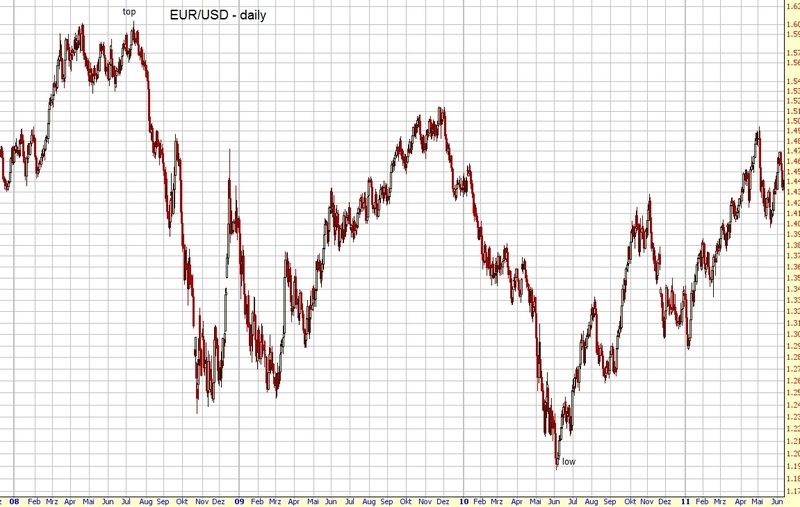 A textbook example of a double zigzag in 2004. 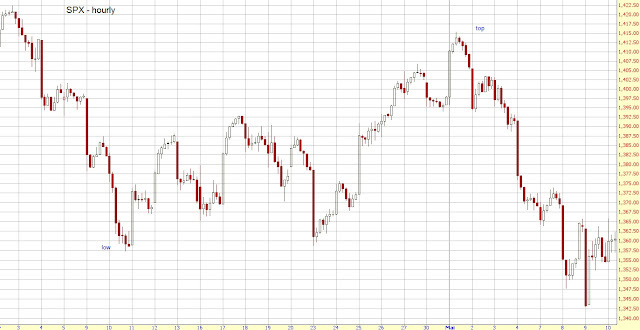 The SPX bottomed in August 2011 at 1100. 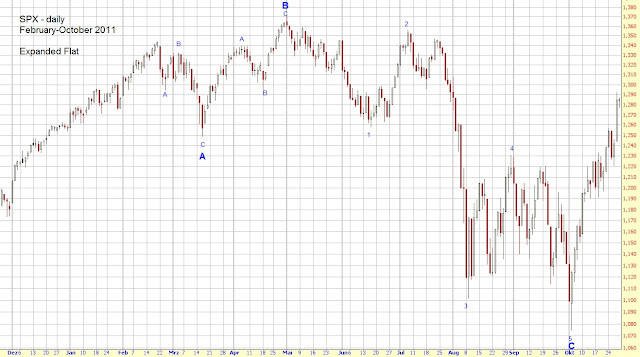 From there we got three waves up to 1210 to complete the first zigzag (wave W). 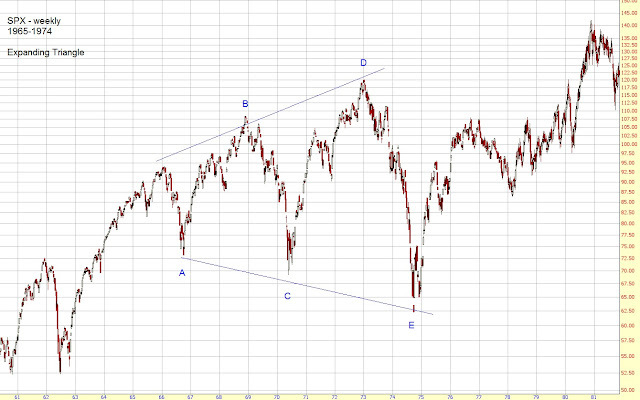 Then an X wave to 1120 followed. Lastly, the second zigzag occured and completed a double zigzag at 1230 (wave Y). 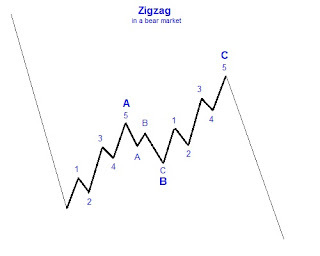 The main difference of flats to zigzags is that wave A is weaker and thus unfolds in three waves. Following this, it’s a bit special because wave A consists of three waves despite trending in the same direction as the wave of one larger degree. 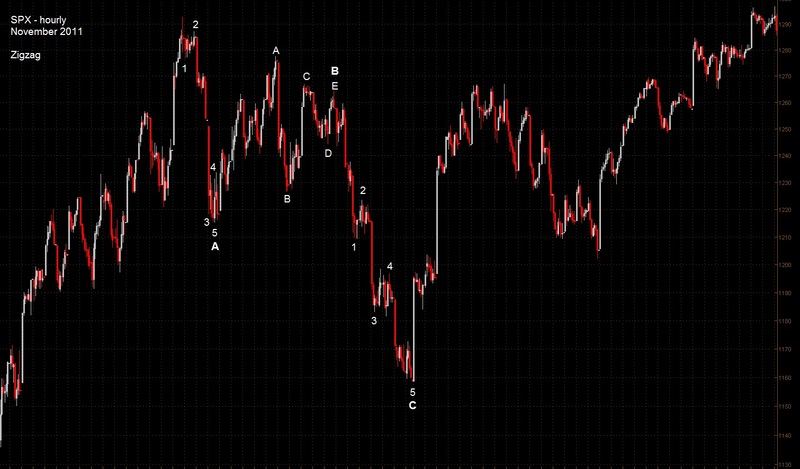 This results in a B wave which retraces most of wave A (at least 70 %). Wave C completes the flat and terminates usually near the end of wave A. 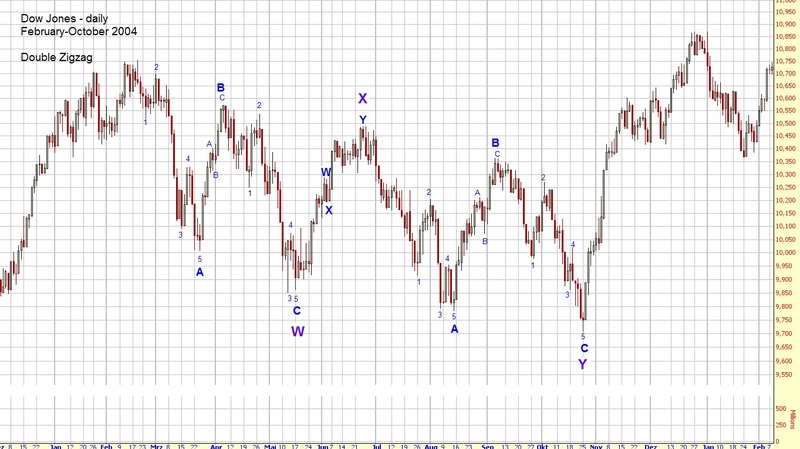 If wave B retraces more than 100 % it’s called an expanded or irregular flat. 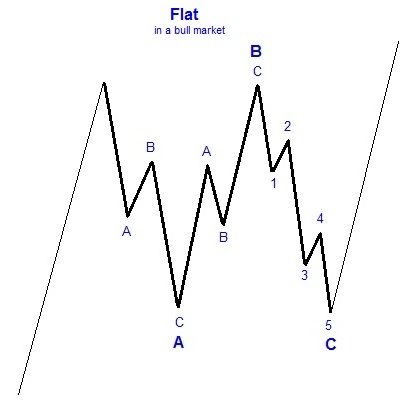 If wave B retraces more than 100 % of wave A and wave C falls short of the end of wave A it’s called a running flat. Running flats are very rare so it was actually very difficult to find a good example. 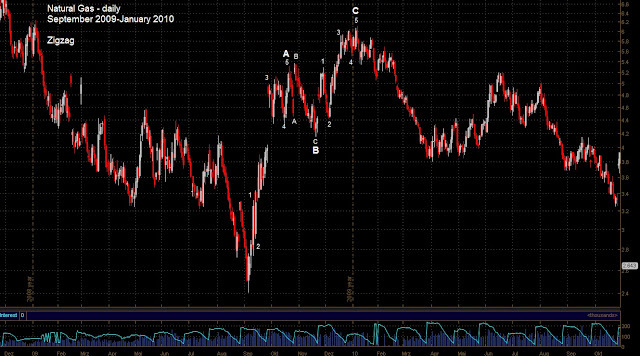 The best example I found occurred in 2009. 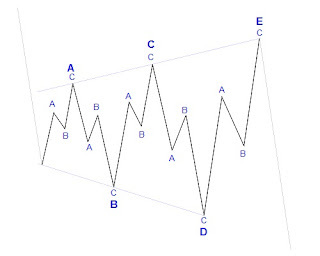 A triangle subdivides into five overlapping waves which are labeled A-B-C-D-E. Each of these subwaves subdivides into three waves (usually zigzags). 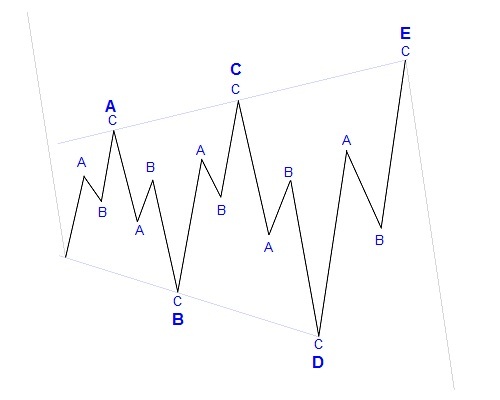 Despite triangles being a bit special because they consist of five waves (and not three) I think they are still easy to identify as correctives. 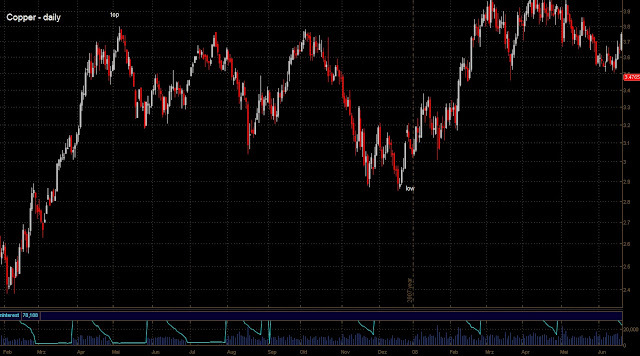 A triangle is either contracting or expanding. Wave C does (not) move beyond the end of wave A. 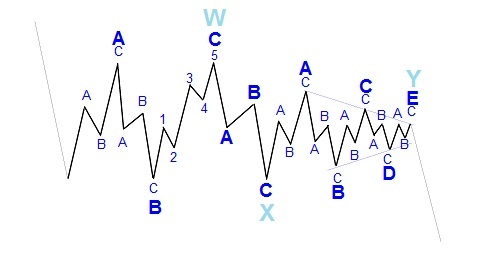 Wave D does (not) move beyond the end of wave B. 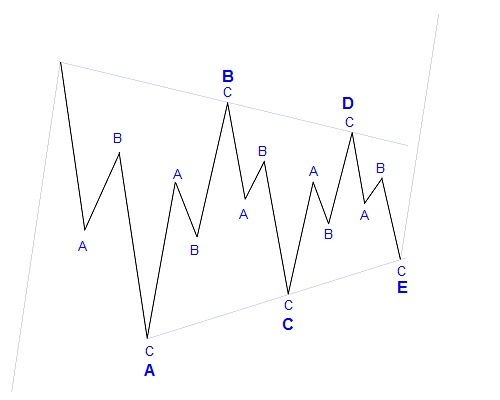 Wave E does (not) move beyond the end of wave C.
These rules basically ensure the expanding/contracting nature of the triangle. 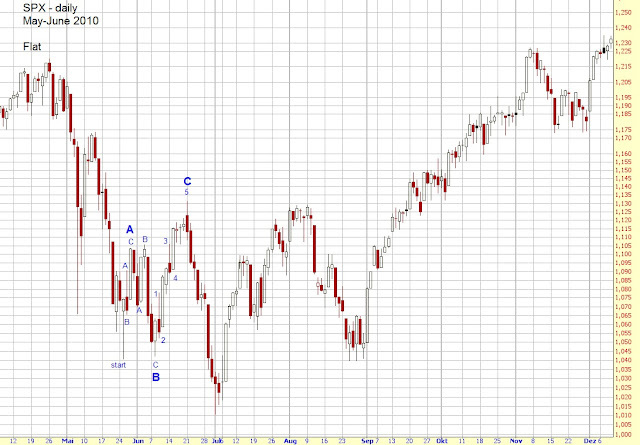 In November 2011 the SPX formed a contracting triangle. 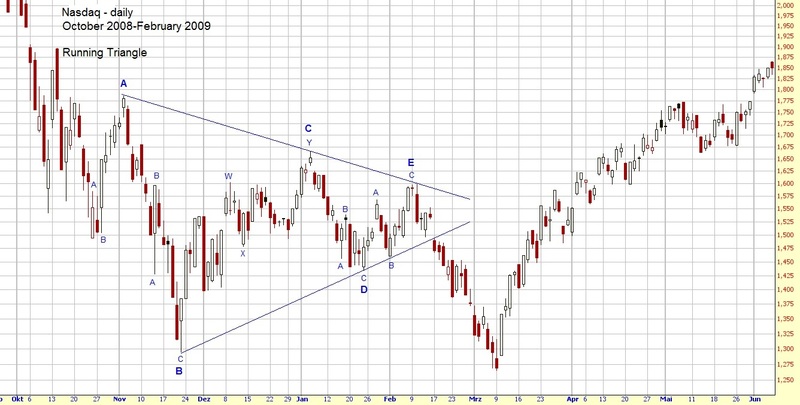 You can nicely see the contracting shape and that each subwave gets shorter in price and time as the triangle progresses. The bear market during 1966 and 1974 took on the shape of an expanding triangle. 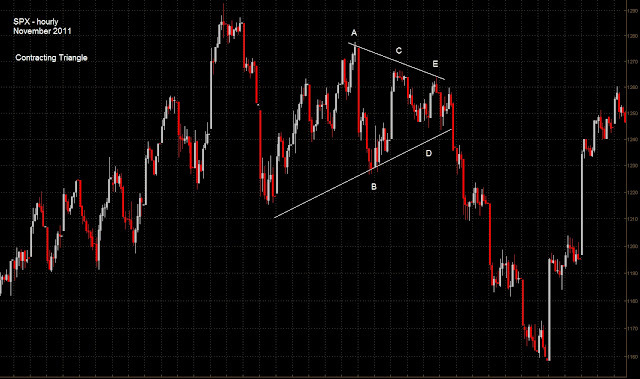 If wave B of a contracting triangle moves beyond the start of wave A it’s called a running triangle. After the crash in 2008 the Nasdaq formed a running triangle. 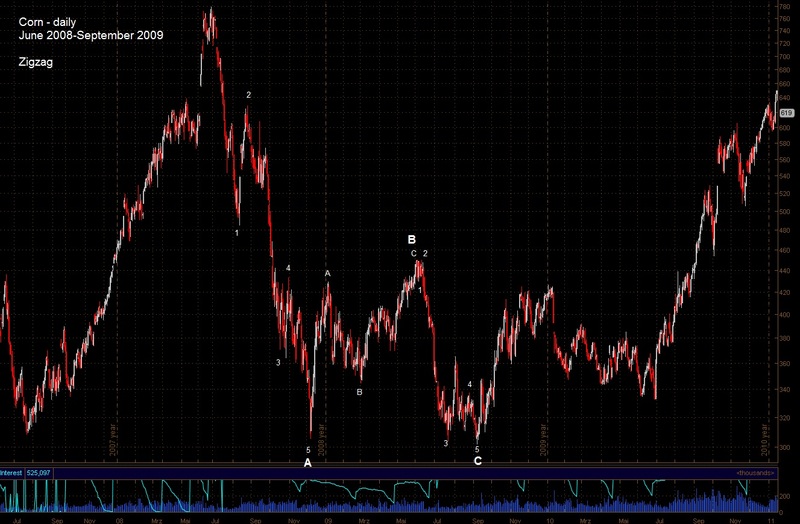 You can see that wave B moved beyond the start of wave A. 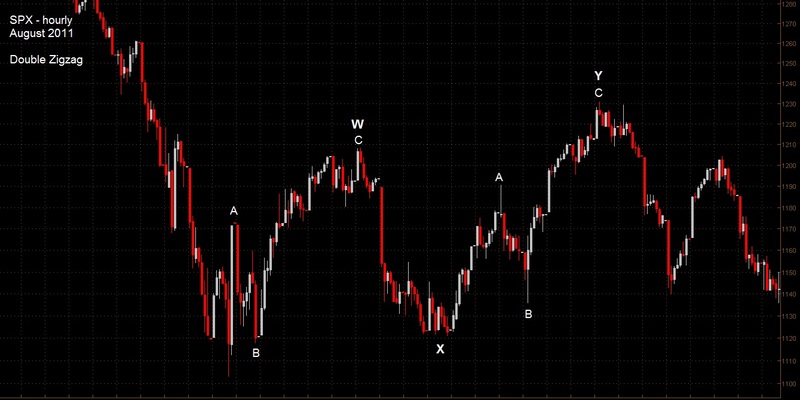 Combinations are basically just two or more corrective patterns combined. If a combination consists of two patterns it’s called a Double Three. If three patterns form a combination it’s called a Triple Three. For some reason double and triple zigzag don’t fall in this category. But every other combination (e.g. Flat-Zigzag, Triangle-Flat, Flat-Flat-Flat) is such a pattern. 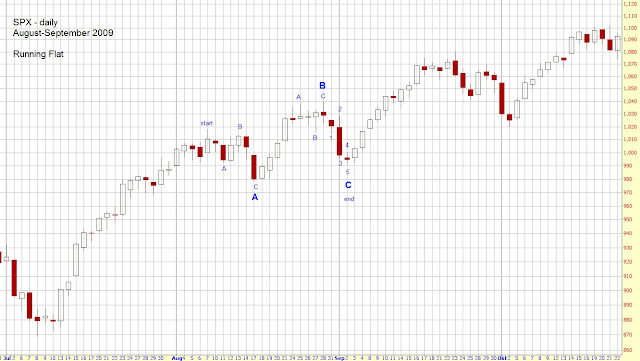 The first corrective wave is labeled W, the second Y, and the third Z. They are separated by a correction of any type which is labeled X. 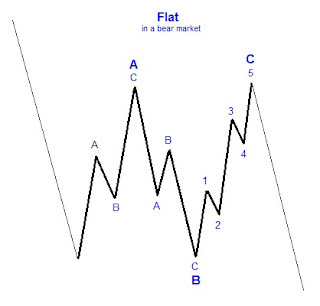 You know now all Elliott wave patterns and the most important rules. In the next chapter you'll learn a few guidelines which will help you to find the correct count. 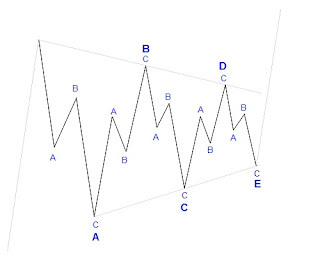 Name and label this corrective pattern. 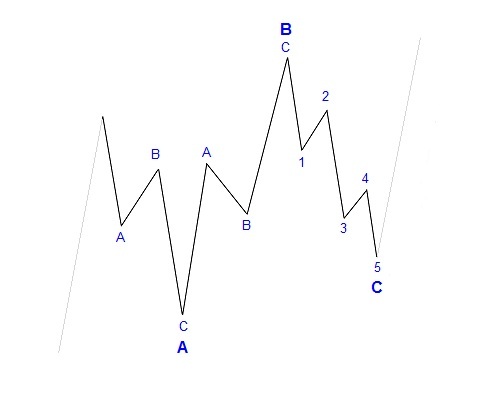 Also name and label wave A. 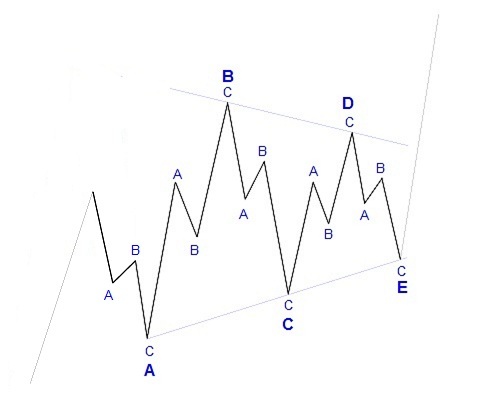 Name and label this corrective pattern. 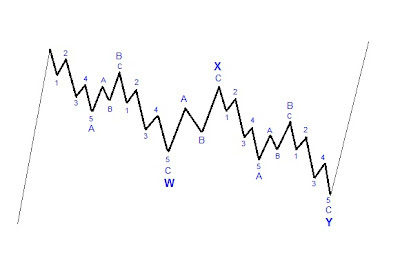 Also name and label wave B.